Talk to a trusted adult if you can't cope with your clique's jealousy by yourself. Whether your supposed BFF can't keep her envy over your cute wardrobe in or the green-eyed monster is rearing its ugly head every time that your friend talks about your picture-perfect boyfriend, jealousy is a challenging emotion to deal with. When your teen friends are jealous about an aspect of your life, handling them with tact and respect is essential to resolving envy-related issues and potential problems. As of 2011, nearly 95 percent of all teenagers used the Internet, according to statistics from the Pew Internet and American Life Project. If you're online -- and chances are that you are -- social networking is causing a new type of envy among teens. When your friends -- whether online acquaintances or friends from school -- view your sensational-looking selfies or see the pics you posted of your family's trip to the Caribbean, they may feel and act jealous. This can result in real-life comments or online insults. You can handle this tech-type of jealousy by deleting these so-called "friends" who are now making jealousy-fueled comments. Another option is to cut down on your own posting. If you aren't posting, your friends have nothing to get jealous about. Teens, like adults, may fall prey to jealousy when a friend starts a new relationship. Although your new guy isn't going to take the place of your BFF, she may think otherwise. When your envious friend starts spewing insults -- such as, "Why are you even with John? He's not even popular." Take a step back and understand that she may not really think he's such as bad date -- she may feel jealous of your new relationship. This doesn't mean that she wants your boyfriend for herself, but that she is jealous that he gets to spend time with you or share your secrets. Calm your friend's anxiety and make it clear that you aren't discarding her and that you care about her just as much as you did pre-guy. Additionally, make sure to spend time with your friend without your boyfriend around. 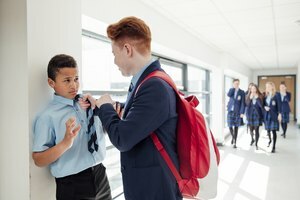 A Pennsylvania State University study on teens and jealousy found that highly jealous high-school students also had lower self-worth and a higher degree of loneliness, according to the American Psychological Association. A peer's jealousy may not necessarily stem from envy but may come from a place of self-hatred or social isolation. For example, your friend may act in a jealous way when you score the winning touchdown, not because he dislikes you, but because he dislikes himself for his lack of athletic ability. In this situation, the jealous peer needs your friendship and kind words. Avoid lashing out or arguing with the friend, as this is likely to make matters worse. Instead, boost your bud's self-confidence with a pleasant, "Yeah, but you're way better at basketball than I am" or a similar compliment. While it's possible to talk through jealousy with a good friend, sometimes teen envy can go overboard to the point to where it becomes problematic. If your "friends" at school are spreading jealous rumors or teasing you non-stop, you have the option of moving on. Instead of sticking around to allow these "friends" to torment you, cut them loose and look for a true group of pals to hang out with. 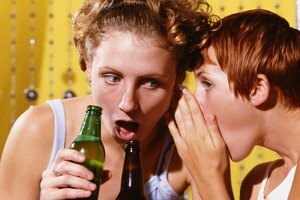 Psychology Today: Are Your Friends Trying to Ruin Your Love Life? Loop, Erica. "Tips on Handling Jealous Teenage Friends." Synonym, https://classroom.synonym.com/tips-handling-jealous-teenage-friends-16292.html. Accessed 25 April 2019.